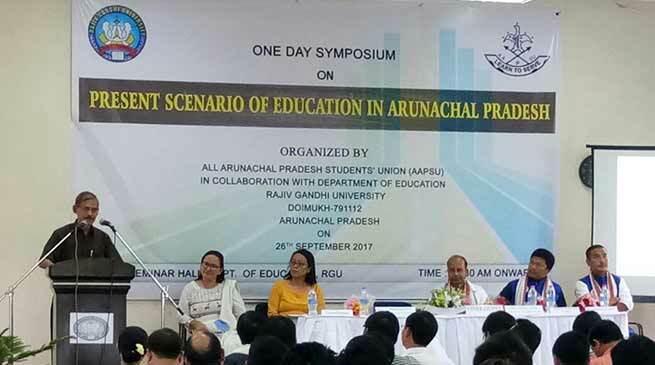 The All Arunachal Pradesh Students’ Union in collaboration with Department of Education, RGU conducted a one day symposium on ‘Present Scenario of Education in Arunachal Pradesh’ at seminar hall Education department here today in RGU. Attending the inaugural function as the chief guest, Vice chancellor of RGU, Prof. Tamo Mibang said that the root of all developments is Education and therefore the quality of life depends on the quality of education too. Stressing on the importance of quality education he maintained that quality does not mean well equipped classrooms, laboratories, halls or compound, he said that a best laboratory will not produce a good scientist or a doctor, but rather quality education will be defined by the students’ endeavor and efforts of the faculties. Time has come for introspection he warned, to know the place where we stand as teachers, as students. Dr M Q khan speaking on the occasion as the resource person said that the most important segment in the journey of education is the elementary education, because it is the study based on the foundation of any person therefore it is our first and foremost duty to strengthen our elementary education he believed. Citing examples of the ancient times he said that Infrastructures and other amenities cannot guarantee quality education. On being questioned about his take in the No-retention policy he shared that if all students are made passed easily then many will be discouraged to work hard in studies. If the no-retention policy is adopted then the education scenario in Arunachal could be disastrous he feared. Dean of faculty of commerce, Prof. Tasi Kai, moderator of technical session 1 opined that higher learning educational institutes like colleges and polytechnics should not be established in too remote areas where there are no students at all. It is an injustice to the students of such regions where there are no proper electricity, internet and road connectivity, how can such students studying in the remotest regions go together with the mainstream students? Only industries and factories are built in such places for the development of the area. It is a waste of public money too; instead more Government colleges should be built in the capital region he added. Taking advantage of the huge gathering of students AAPSU General Secretary, Tobom Dai urged the students to not only focus on academic line but also to serve the society as the torchbearers of the society. Speaking about AAPSU’s stand on the Chakma-Hajong issue he informed that AAPSU is in no state to go along with the Government’s decision to grant citizenship to the Chakma-Hajong refugees, if compelled AAPSU might go for another phase of protest which could be of 36 hours he added. Highlighting on the present state of affairs of University education system, its problems and remedies in Arunachal Pradesh, Prof. J Sahoo, Dean Faculty of Education explained about the Concept of Quality education with career decision making variables and the 4 pillars of education; learning to know, learning to do, learning to live together and learning to be. Enlightening the gathering on more about the symposium, Secretary Debate and Symposium AAPSU, Marli Kamki said that the symposium was a small initiative from AAPSU as a part of AAPSU’s Golden Jubilee celebration. This initiative will be made a tradition, debates and symposiums of educational values like this will be carried out from time to time in future too he informed.